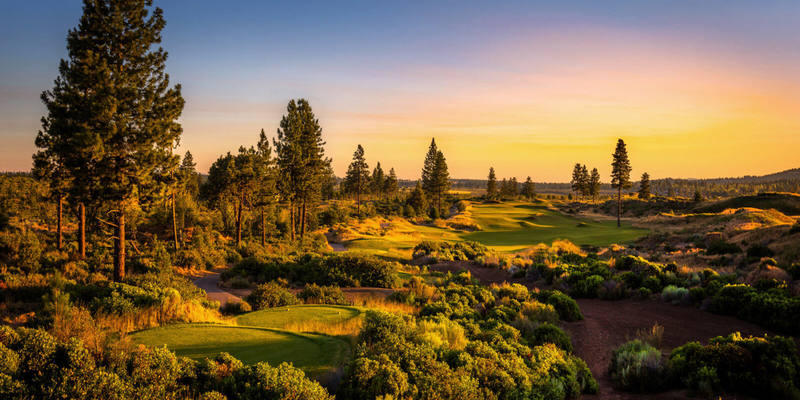 One of Central Oregon's exceptional golf experiences, Tetherow Golf Club is an 18-hole championship semi-private course that boasts a distinctive layout by David McLay Kidd - the award-winning architect of Bandon Dunes and Castle Course in Scotland. The 7,298-yard links-style course features imaginative routing lined by fescue grasses flowing magnificently with the natural terrain. Tetherow offers a diverse mix of holes framed by ragged bunkers, knobs and knolls, and is surrounded by panoramic views of Oregon's high desert and Central Cascade Mountains. Built at an elevation of nearly 4000 feet and located only seven minutes from downtown Bend, the golf course at Tetherow is open from April to November. Tetherow wishes to maintain the highest standards of traditional golf, which include proper attire and etiquette. Collared shirts or golf industry apparel must be worn at all times. Denim is not permitted. Please call 541-388-2582 for current rates. Call 541-388-2582 for rates and tee times. Contact Tetherow Golf Club at 541-388-2582 for more information and details on holding a golf outing at the course. Contact Tetherow Golf Club at 541-388-2582. Contact Tetherow Golf Club at 541-388-2582 for onsite or nearby dining options. Must play! Awesome round of golf! This profile was last updated on 06/12/2014 and has been viewed 12,294 times.